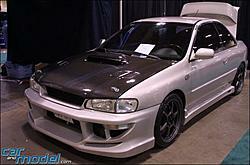 FS: 99-01 Subaru Impreza 2.5 RS C-West Style BODY KIT!! I already posted this thread a week or two ago...however, it mysteriously dissapeared after a few days, RIGHT when somebody said they wanted to buy it! Anyway, I am posting again and I am selling a brand new C-West style body kit which fits All Subaru Impreza coupes (2 doors) from and including model years 1999 through 2001. I'm looking for about $550. This kit is pre-primered and includes one full front bumper, two rear bumper splats, and two side skirts. The normal prices found for these same pieces from C-west is $680.00 for the front bumper, $220.00 for the rear bumper splats, and $440.00 for the side skirts, so its is a pretty good deal! The front bumper ALONE would cost more than this one does here. Also included is a sheet of wire mesh for improved looks in the front grill. If you decide, to PM me, please say that you did on the thread, because I RARELY check my PM's...but you can email me about it at [email protected]. Thanks! Last edited by timdog82001; 03-20-2004 at 06:26 PM. Last edited by timdog82001; 03-20-2004 at 06:27 PM. OK, I have somebody interested in purchasing just the side skirts and rear splats...IS anybody interested in JUST the FRONT BUMPER????? Last edited by timdog82001; 04-19-2003 at 08:27 PM. Last edited by STI-R; 04-20-2003 at 11:23 AM. Now those people are only interested in the rear splats...Does anybody want just the side skirts, just the front bumper, or both? I was wondering what material it is made out of?? so, how much for the front bumper? none of the other parts would fit my car... soo?? how about just the grill? WRX C-west style full body kit! Quick Reply: 99-01 Subaru Impreza 2.5 RS C-West Style BODY KIT! !